With fierce competition among more than 1,000 submissions spanning 38 practice areas, Gardner was one of only five attorneys to earn the distinction of Class Action MVP. 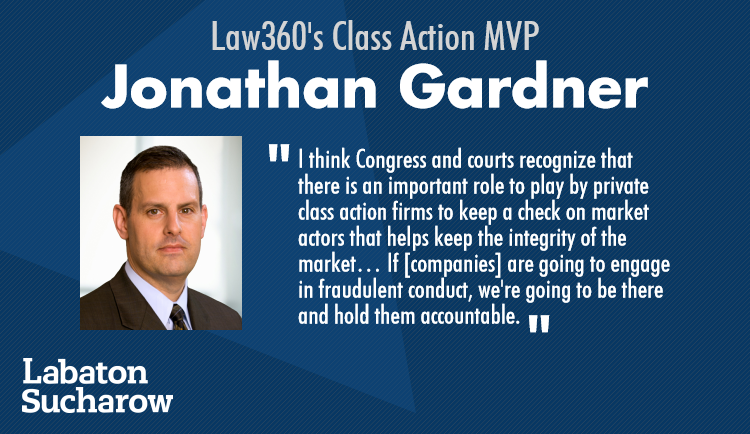 A leading partner in the Firm’s Securities Litigation Practice, Gardner was lauded by Law360 for his work that led to series of recoveries on behalf of the classes he represents—using effective investigation and discovery in conjunction with strong oral arguments to bolster fraud cases. Some of Gardner’s noteworthy cases highlighted by Law360 in a recent profile included suits against the world’s largest gold mining company, Barrick Gold ($140 million settlement); pharmacy giant, CVS Caremark ($48 million settlement); and multilevel marketing company, Nu Skin Enterprises ($47 million settlement), among others. A staunch advocate for his clients and always ready to take on new challenges, Gardner told Law360, "If [companies] are going to engage in fraudulent conduct, we're going to be there and hold them accountable." For more information, a full list of Law360 MVPs is available here.